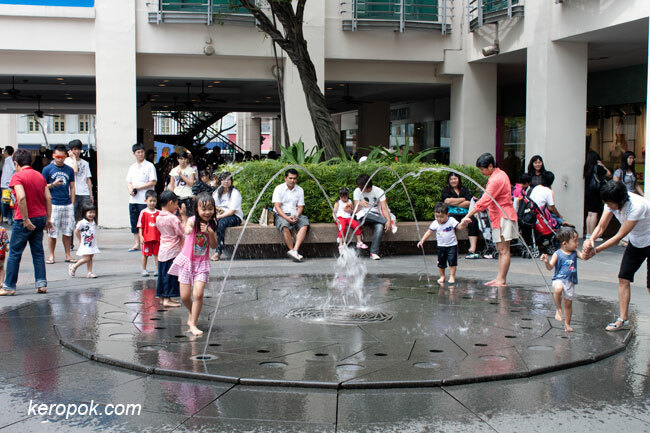 'Boring' Singapore City Photo: Bugis Water Fountain - where kids always get themselves wet. Bugis Water Fountain - where kids always get themselves wet. It has been more than a year since I came to Bugis Junction. I was here on yesterday and I noticed that whenever I am here, there are always kids getting themselves wet playing with water! The parents of these kids actually encourage them to play with the water! They all come with an extra set or two of clothing! A lovely fountain, possibly enhanced beyond the expectation of the designer with happy children making a creative extra use for the water. As a child my brothers and I always enjoyed cooling off on hot days in Singapore when it rained by standing under the runoff from the roof of our bungalow at Lloyd Leas. My brothers would strip off naked whereas I was a little older and more self conscious and would go and put on a pair of swimming trunks. Very refreshing, thank you for this image and stirring a memory from just over fifty years ago. ROFL.. well, at least it distracts the kids from crying. instead they are playing with glee. must be so cute!